In the 5th century (at the earliest) an author wrote a number of works which he purported were by the 1st century man called Dionysius, who appears in the biblical book of Acts being converted to Christianity by St. Paul, and later became bishop of Athens. In his 'Celestial Hierarchy' he discusses the nine orders of angels (Seraphim, Cherubim, Thrones, etc.). The text was translated from its original Greek by Robert Grosseteste (d.1253), who also provided an extensive commentary. This copy, still in its original binding, was owned in the Middle Ages by the Abbey of Holy Cross, Waltham, a few miles north of London. 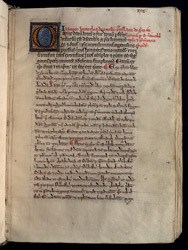 The rubric gives a full account of the contents: 'Here begins the Hierarchy of Dionysius, translated from Greek into Latin by R[obert], bishop of Lincoln, and commented by him'. The text and commentary are clearly distinguished by the two very different kinds of script.